Throughout history collectors have gathered major art works, sculptures and other treasures for future generations. Good collectors are like detectives, following elusive trails to new acquisitions. Almost any object has collectors seeking it out. Fortunately Alan G Bates chose vintage harmonicas, and over a 10 year period created a 2500 instrument collection, second only to the Hohner collection in Trossingham. With a generosity common to many great collectors, Alan Bates donated his collection in 2000 to the National Music Museum at the University of South Dakota. Part of the collection is on permanent display (as shown below), other instruments may be seen by appointment. 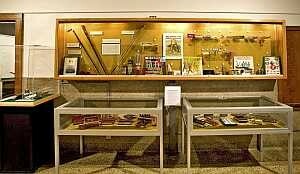 The collection includes 600 harmonica recordings. In 2008 he added 2000 items, including posters, instruction books, and historic harmonica catalogs. Alan Bates trained as a chemical engineer, receiving his M.S. from MIT in 1951. He had a distinguished corporate career, becoming VP of a US based chemical company, then president of a startup bio-technology company in Canada. Along with his professional responsibilities, he became interested in collecting. 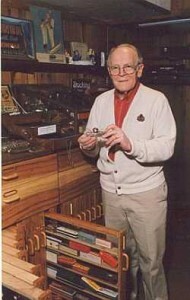 His interests included wood working tools, resulting in a major collection of vintage wood planes. During the 1990s he resolved to establish a major harmonica collection, inspired by the one at the Smithsonian Institution donated by Peter Kassan. The timing was fortunate. Alan Bate’s collecting skills enabled rare instruments to be sourced at modest prices, sometimes by trading up to get items in their original boxes. Such a collection would be much harder to put together now. eBay ensures that rare items are now widely seen, with prices set by the market. This competition would greatly increase the setup cost of a large collection like the Alan G Bates one. The Alan Bates collection tells much about past marketing ploys and musical tastes. These days harmonica players are concerned more with function (and price) than external decoration. This has not always been so. The collection includes many instruments whose covers reflect the emerging technologies of their day. Turn of the century (circa 1900) Hohner harmonica covers featured the newly developed Zepplin Airship, along with Mattias Hohner (the company founder) and Count Ferdinand von Zepplin. Another harmonica available at that time was shaped like a cartridge. The collection also includes the Hohner “Auto” circa 1920s, with covers shaped like a touring car, as shown opposite. Other harmonicas include the “Trumpet Call” (still available), with five miniature trumpets attached to the harmonica case. These were for appearance only, having little effect on the sound. The 19th century featured many harmonica manufacturers, with Mattias Hohner the most successful of them (Hohner remains the world’s leading harmonica company). 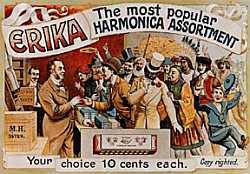 A key factor in Hohner’s success was early penetration of the American market, the harmonica being a popular instrument during the Civil War. The collection includes early Hohner promotion material for America, including the poster shown opposite featuring Mattias Hohner. The collection also include instruments developed for other markets. 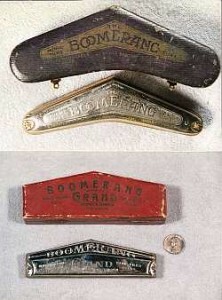 Prominent amongst these were the “Boomerang” harmonicas, widely sold in Australia and shown opposite. A past innovation was the “player harmonica” where a paper roll played a tune on a hand cranked instrument. The resulting sound is hard to imagine, the effort to produce it surely similar to that required to actually play the tune. The collection includes a number of these player harmonicas, along with 240 music rolls. The National Music Museum was founded on the campus of the University of South Dakota in 1973, and now contains around 14500 instruments. Amongst its treasures are Stradivari mandolins and guitars, the earliest French grand piano (1781) and leading collections of saxaphones, clarinets and brass instruments.